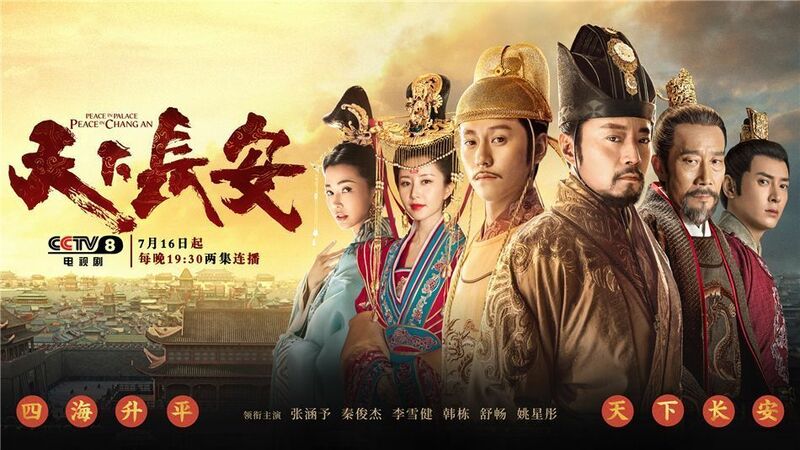 Peace in Palace, Peace in Chang An 天下长安 which stars Qin Junjie (Spy Hunter) and Zhang Hanyu (Against the Light) was all set to premiere as a primetime drama beginning July 16 on CCTV8. On July 15, an announcement was made to inform viewers that the premiere has been postponed. I couldn't make sense of the explanation other than there seemed to be an issue with the version they planned to air and the broadcasting schedule. It sounds like a weak excuse, but it is what it is. Personally, I'm just disappointed. Despite the summer rush of dramas, this was one drama I was willing to make time for. It has intrigue, politics, brotherly tension, history and seemed like just the kind of historical drama that's been missing all year round. This was supposed to air on CCTV which is government-owned, yet it still failed to escape the curse of not being able to air. 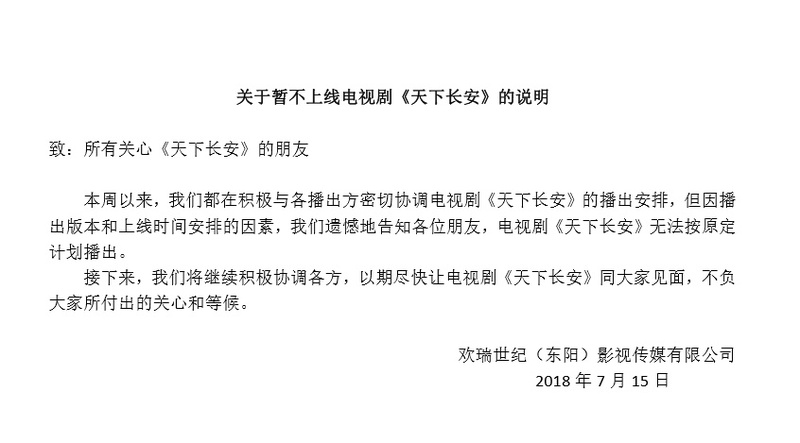 Update: At around 2am, Director Lian Yiming (Ten Miles of Peach Blossoms) finally spoke up via weibo. 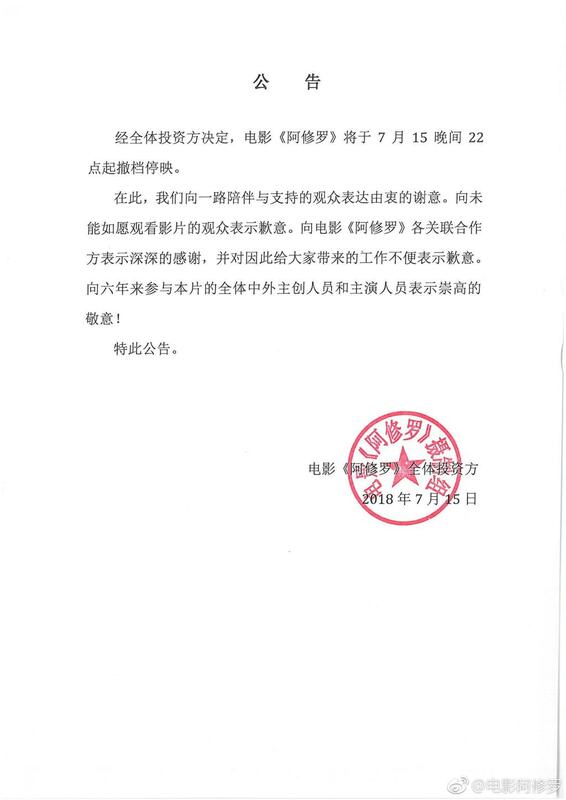 He wrote, "Tian Xia Chang An has been postponed! No words! Change it again and I won't recognize it any longer! Hope it can air soon! This drama holds a special meaning to me! And also painful memories! 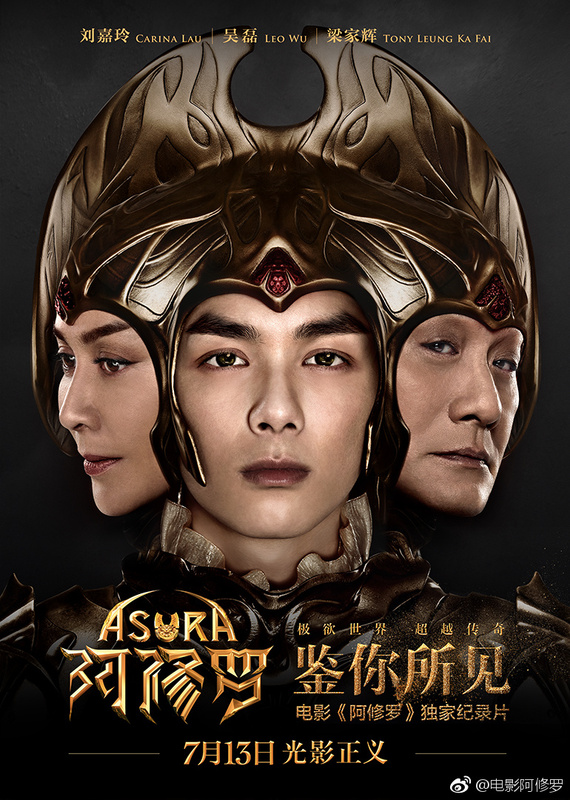 Asura 阿修罗 which is a movie starring Leo Wu Lei (Sand Sea), Carina Lau (Eighteen Springs) and Tony Leung Ka-fai (League of Gods) premiered on July 13. On July 15, an announcement was made to inform viewers that the movie has been pulled from theaters. The reason wasn't made known except that it was a decision made collectively by investors. I don't know which one had it worse. While I wouldn't have been able to watch Asura in theaters anyway, the movie took a lot of years, a lot of people and a lot of money to make. Wu Lei was still underage when shooting the movie and he's officially an adult now. He was even on tour recently to do promotions for Asura, so it's a pity the way things turned out. Whether good or bad, at least let it air? They'd rather remake old dramas like Meteor Garden and Summer's Desire a million times, but refuse to let historicals air. This is a very tough year for historical dramas. Disappointed to hear this, "Peace in Chang An" was definitely on my watch list because I adore Shu Chang (she deserves more lead roles!) and it's been awhile since I've watched a "proper" historical drama (most of the big ones in the last few years have been wuxia, xianxia, or highly fictional so I've missed these type of dramas). Hope the delay won't be too long, and hope they won't need to change/cut too much as it would be a shame if that affects the quality of their drama. I was planning for this to be my next drama after Fuyao finishes, guess I'll have to wait and see if it gets the go-ahead by then.